2Do offers a lot. The feature you are searching for is not integrated in your current choice of task manager? Chances are *really* high that 2Do not only features it but implements it in a functionally and aesthetically pleasing way. Surprisingly, this holds true especially for the mobile apps. So is 2Do where all search for a good task manager ends? While you can get really happy with the plethora of options offered the real challenge is to pick your set of features wisely. ”Do not confuse motion and progress. but does not make any progress." People that are able to afford thinking about their projects before doing them can easily end up doing nothing else than thinking. To avoid this, some task managers have certain restrictions to help you concentrate on the task at hand and not whether you like its color better in blue or red. On the flip side, there is this desire to have your own way of planning, using your preferred method to organize your tasks. The latter sentiment has a next-to-perfect remedy: 2Do, coded by Guided Ways Technologies, includes almost all of the options available in the field while adding some nice treats themselves. The app has been around for quite a while now but recently received a significant update on iOS (3.0) in terms of features and looks, so it’s worth giving the shiny interface a whirl. 2Do is the king of options in a shiny and very useful wrapping. 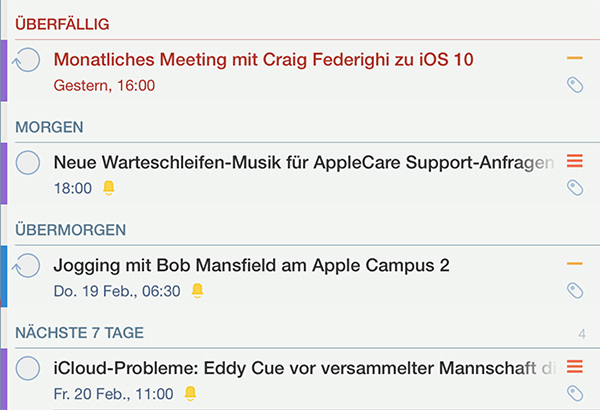 To test the app I imported my 300-something tasks from OmniFocus2, since the real value of task managers starts at a level of complexity no longer easily overviewed on a piece of paper. *Importing* here is a euphemism for copy/pasting from OmniFocus and redigesting all of the projects and tasks- to refer back to Montapert, that would now actually be motion, not progress. To spare you the same effort and help you make an informed decision, read on. Reducing visual clutter is a proven technique to increase productivity, Apple leading the way with its Yosemite update. Hence, apps like the recently reviewed Typed are all the rage, creating a soothing and pleasing noise-free environment to aid your focus while writing. The problem is that some projects just are complex. 2Do’s philosophy is functional flexibility: to put as many tools of discrimination at your disposal while not forcing any planning or scheduling dogma upon you. You can use 2Do as a simple list manager with due dates, but if things get complicated scaling up to full blown three-level prioritizing, Audio and image attachments and tag-supported smart lists is just a few clicks away. On OSX as of writing this the interface is not fully up to date yet. 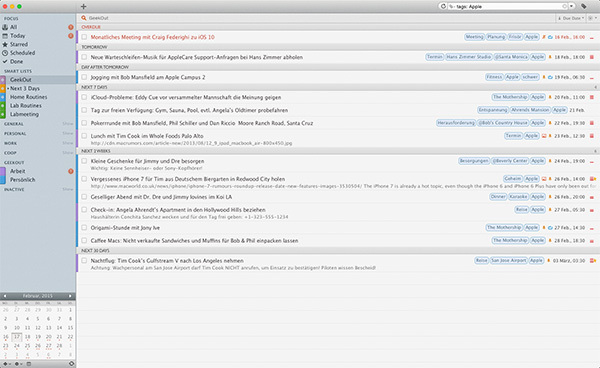 The brand new Yosemite update is in the works, and it is very likely that we are going to see adaptations resembling the absolutely gorgeous- functional interface on the mobile versions. 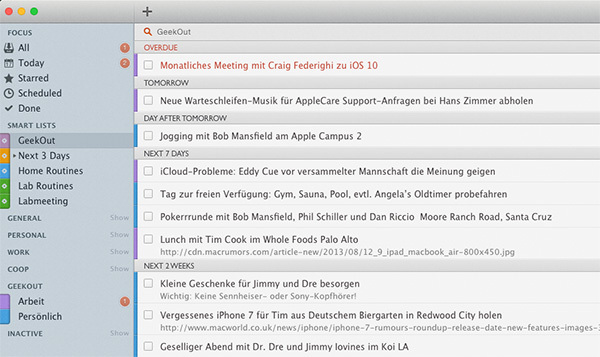 Visually, on the Mac there is not so much space between 2Do and its competitors, be it Things, OmniFocus2 or THL. The biggest difference are the already mentioned vast options to classify your tasks. Every feature, be it tag, priority, start and due dates or star can be searched and sorted. Together with keywords these searches can then be combined into so-called smart lists, saved searches that you can revoke via clicking on the “list”. As Guided Ways replied to our inquiry, list groups are going to join the other features as a means of filtering and designing smart lists soon. The syntax necessary to combine all the different search phrases with boolean syntax (and, or) can be found here. One additional planning detail is that stars can be added to the three levels of priority, serving as an independent marker of importance. Also of note is the option to set alarms independent of start and due date of the task itself- why is no one else implementing this? In terms of planning depth 2Do is also among the leaders. The levels of hierarchy are: List Groups, Lists, Projects and Tasks. One unique feature of 2Do are dedicated Lists: tasks in these specialized projects by definition don’t have start and due dates, but you can still set individual alarms and priorities for them. This feature is really handy for shopping lists of any kind, reading lists and the likes. In case you started a task (assigned a start date) but were not able to finish it, 2Do will not simply remove the task from today view (I am looking at you, OmniFocus) but keep it alive in a dedicated “still working on…“ area of the today view- and I can’t tell you how often this feature has saved my bacon. If You’re a fan of keyboard shortcuts, 2Do will serve your needs as well- there is quite a selection of task manipulation and navigation shortcuts documented in the manual to speed up data entry. While the handling reminds me a lot of gmail(which is good! ), I did not experience the joy of handling tasks from my keyboard as I did with THL (review coming soon!) – you have to tab a lot until you reach your desired feature down the tasks various options. Generally, the interface feels more designed to be interacted with via pointing devices, the keyboard option being viable but secondary. 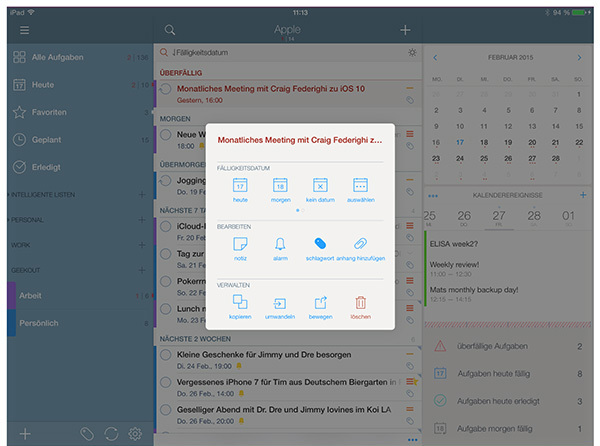 Drag and drop actually is one of the hallmark features of 2Do. The moment you start dragging one or many tasks additional areas appear in the top bar, allowing you to copy, move, delete or change start/due in batch. Dragging and dropping also works on iOS, I kid you not. 2Do by many means is demonstrating what is possible- all in one app. It is comparably easy to simply stitch any feature found on the desktop version to the mobile equivalent. On iOS the magic of 2Do is happening – I have never before seen an interface this functionally well adapted to the smallish iPhone screen – this is the area were 2Do is on the edge of development, being among the most innovative of the field. Depending on your current needs you can swipe your way through either project- or task-oriented views. One more swipe reveals the tag area where you can easily narrow down your focus. You want oversight? Pinch the screen and thereby choose from three different levels of task detail displayed in the task area. This idea is as simple as it is intuitive- I love this! The options to sort your lists are: status, priority, originating list, start/due date, creation date, note attached, title, tag, location, duration and, most importantly, manual. This lets you reorder your tasks irrespective of all the other features. 2Do will also remember your choice for that particular list or view and present tasks according to your last settings. In addition you have switches for ascending or descending display and whether the grouping features should appear in the list or not. Repurposing tasks is a breeze with 2Do: one long tap and you are presented with an array of options to schedule, edit or manage (copy, delete, convert or move). 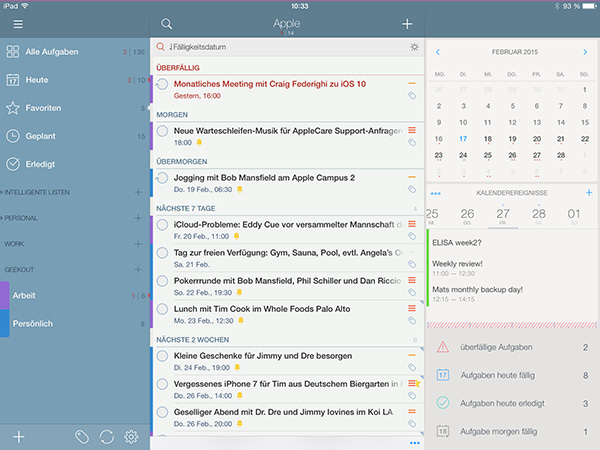 Finally there is grouped actions: whenever you need to manipulate more than one task at a time, say, when tagging certain items, you can do so by tapping the three dots in the lower right corner of the task view to unfold options for manipulation, such as move, tag, and date manipulations. During this mode the checkbox circles are dotted, indicating that selection will not complete the task but select for being included into the grouped modification. This feature as well as many many others are available as tutorials on the company’s own YouTube channel, a very helpful resource since there is no real manual for the iOS version available. Synchronization became a major decision factor for being able to trust your task manager. Two factors here seem to have the biggest influence on syncing speed: location of the server where the database is stored and the actual size of the database. 2Do offers the biggest array of options here, namely Dropbox(recommended), Toodledo and via OS X reminders. In spite of the plethora of options this seemed to be a minor downside to 2Do compared to others. Since the dropbox server might be in the US, syncing of 300+ tasks took around 2-3 minutes while subsequent syncs could vary between 1-20 seconds, depending on your syncing frequency with this device. This is no deal breaker in itself and of all the options, Dropbox definitely is the most stable choice. Depending on your current connectivity sometimes tasks did not yet finish synching while I already closed the app, leading to the nagging feeling of needing to sync manually. 2Do therefore suggests to activate regular deletion of completed tasks and projects and offers such an option in the “appearance” tab of the preferences of the OS X version. While you are able to archive whole lists, there is no possibility to archive tasks of projects. This can significantly increase your database over time and thereby delay sync. It’s also a pity that there is no way of archiving previously finished tasks in chronological order. However, this downside is overcome if You sync to Reminders. 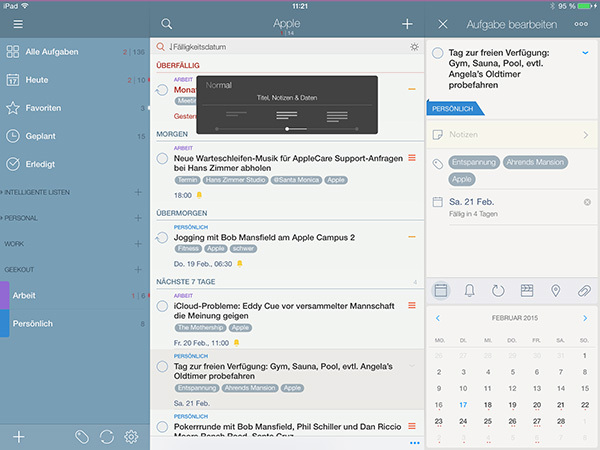 Although it has its limitations as well (no sync of unused tags, no syncing of list groups) the sync is fast and by having every task in the Reminders app as well, calendaring applications like Apple Calendar, BusyCal or the iOS powerhouse Pocket Informant can share and edit all tasks. If you ever dreamed of freeing tasks the way Markdown freed writing, 2Do offers you the option. Did I mention how functionally gorgeous the interface is? So that’s it – a huge roundhouse kick on 2Do, the most versatile of the competitors. If you would like to read more about this app, maybe some smart search examples or other ideas beyond the documentation found here, we still have some tricks up our sleeve we could publish by request, so don’t hesitate to comment below! To return to Montaperts quote, 2Do is going to tempt you to rock in one place by its sheer overwhelming array of options. You feel brave enough and want all the possible options available? Then dive in because 2Do is going to be your best friend on the Mac and especially on mobile platforms – the UI is just dead gorgeous while being thoughtfully functional. 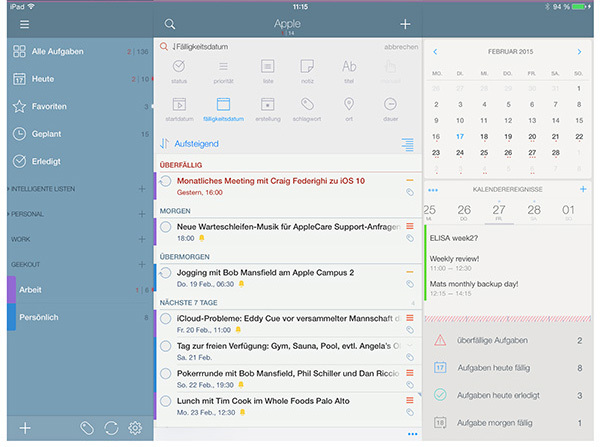 Also, the mobile clients are next to identical to the OS X counterpart in terms of features, so if you anyway are only handling tasks on mobile, get the beautiful universal version for iOS at a comparably low price (some companies charge you for iPhone and iPad separately) and enjoy a full-featured and independent task manager while having access to them on OS X through Reminders sync and Calendar apps. While mentioning the syncing glitches I experienced, the intermittent syncing is immediate, especially if you are syncing frequently. 2Do is all about choice – if you are someone who has a hard time making them, we are also a little reluctant with recommending this app to you. If, however, you feel able to make choices well and need all the options available in a beautiful wrapping, this is your task manager. Period. alender-Apps oder der Erinnerungs- App auf OS X verfügen können. Im Normalfall ist die Synchronisation unmittelbar und zuverlässig, besonders wenn sie oft abgleichen. 2Do for Mac requires OS X 10.8 (or newer) and is available on the Mac App Store for $49.99 / € 39,99. 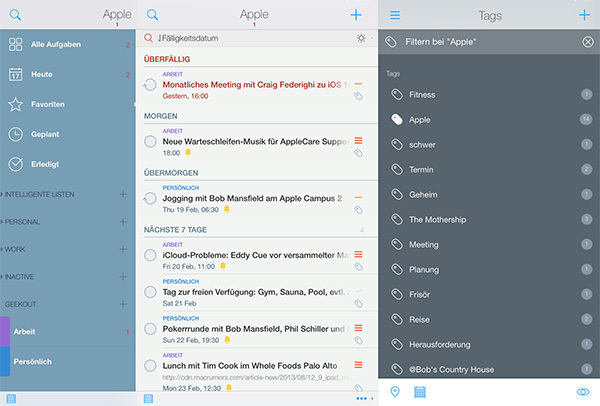 2Do für iOS is an universal app for iPhone, iPad and iPod touch and requires iOS 7.0 (or newer). It is available on the iTunes Store for $14.99 / € 14,99. *Ads and affiliate links: By ordering products through ads or links marked with an * on this page, we receive a small provision. You are thereby actively contributing to the continuity of GeekOut.io.